It's hard to argue with any of that. Carlvagio's purchase of an additional 5,000 shares sent us over the 357, 358, 359, 360, and 361 billion isk marks and earned him a Quintuple Supreme Protector's Tip of the Hat™. Carlvagio is now the New Order's sixth-largest shareholder! 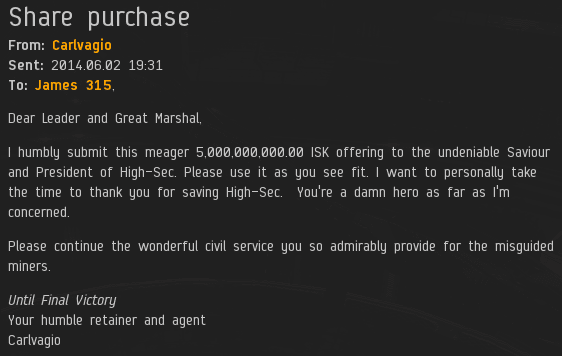 Icing on the cake time: Ezekial 2517's purchase of 200 shares sent us past the 362 billion isk mark and earned him a Supreme Protector's Tip of the Hat™. Ready for one more? Matrea D's purchase of an additional 1,000 shares sent us past the 363 billion isk mark and earned her a Supreme Protector's Tip of the Hat™, too. It all adds up to more fun to be had in highsec! It's wonderful to see people adding content to the game. Today the failure of leadership. Today i added the leader of New Order named James 315 as well as the local agent (system Kino named Bing) so that they show online on chat list. Then i visited the local ice field. As you can see with your own eyes: Both the leader as well as the local agent is Online(thats usually). BUT at the same time bot fleets of Retreiver and other non-permit miner infiltrated the icefields. Carl your a friend of ours and we look forward to working with you more!